Gluten-free, vegan and full of protein, vitamin C and fiber — this delicious creamy, dreamy, chia seed pudding tastes just like a creamsicle... the healthy version! When I threw this together, I had no idea its flavor would resemble the orange cream popsicles from my childhood as well as it did. This delightful chia pudding chock full of fiber & vitamin C, makes a refreshing breakfast, snack or dessert--creamy, quenching, energizing, healthy, and delicious! You can use any dairy-free or dairy milk of your choice for very similar results. You can omit the maple syrup altogether for a version free of added sugar, or you can replace it with honey, agave syrup or this sugar-free monk fruit syrup for a sugar-free version. The vanilla extract is crucial for the ‘Creamsicle’ flavor. If you do not have extract, you can also use a pinch of vanilla bean powder as an alternative. Freshly squeezed orange juice tastes best, but in a pinch, a splash of any orange juice will work, too. Be certain to refrigerate for at least 6 hours for best results. You can prepare this chia pudding ahead of time and keep covered in the refrigerator for up to 5 days. Gluten Free, vegan and full of protein, vitamin C and fiber. 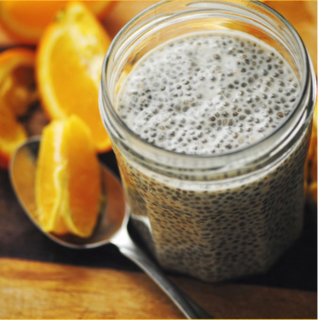 This delicious chia seed pudding tastes just like a creamsicle... the healthy version! Mix all of the above ingredients.Chill in the refrigerator overnight.Garnish with orange slice before serving.Enjoy!